Trying to foretell the next major developments in technology, and how they will affect teaching and learning, is risky business. Steve Smith from ICT provider Ramesys gives it his best shot. Predicting how ICT will change in the next 20 years is fraught with complexities, and as such is reserved for the extremely brave among us or the particularly foolish. This is due to the fact that technology has and continues to develop with such speed that the future cannot be foreseen with complete certainty. Even some of our most admired industry figures have expressed inaccurate technological expectations. Bill Gates, CEO of Microsoft, was quoted in 1994 with saying: "I see little commercial potential for the internet for at least ten years," while Thomas J. Watson, IBM Chairman in 1943 commented: "I think there's a world market for about five computers." With that in mind, here is my prediction for the way that technology will change the education landscape in the next few years. Schools and colleges across the UK are facing rapidly changing and ever more complex technological challenges. Students can now connect to resources barely imaginable a decade ago and there is no doubt that state-of-the-art applications will continue to emerge over the next decade. The 21st century learning environment will see teachers and students empowered by technology as it revolutionises the teaching and learning process. In terms of schools, through Building Schools for the Future, it is intended that ICT will be fully integrated into the physical design. The most enlightened capital projects, both in schools and colleges, will accomplish this through designs that allow for an element of ongoing ICT refresh, which enables the technology to evolve alongside pedagogy and building design. If this happens, schools and colleges will move from being fixed and inflexible, in terms of both ICT and buildings, to new high-tech learning environments boasting mobile, wireless and personalised technologies. The CD and DVD based content that has become so familiar will be a distant memory as we make way for online web-based content, virtual classrooms and video conferencing technologies. Multiple devices such as mobile phones, PCs, and PDAs will potentially be scrapped in favour of one portable device. For example, even laptops are today, largely, portable workstations rather than individual student learning devices as we can expect to see in the years ahead, such as the Ultra-Mobile PC (UMPC). With all the computing power of a desktop PC in an A5 plastic folder, the UMPC is capable of fitting into a student's pocket. 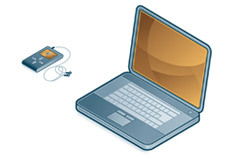 As it is enabled with wireless technologies, it is entirely possible that this device will replace the laptop or tablet PC used in education today. Although the pace of such change will depend on the extent to which students can carry out the 'high demand' activities such as video editing via wireless technology, school and college leaders can fully expect this change to occur. The implications of these emerging technologies for leaders are varied: to move ICT from a capital to a revenue issue; to ensure connectivity and bandwidth are kept at the highest possible level (including wireless enablement for both coverage and throughput); to carefully consider the nature of the device being adopted at refresh, as a fixed PC may not be the best option in three years' time; and to experiment with new technologies in a controlled way. Perhaps the single most important opportunity lies in the ability to 'centralise' services, currently delivered from separate servers, to one outsourced service provider. Services such as firewalls, email, internet and email filtering, back-up, management information systems, and learning environment products are among the most costly and complex to locate on site and often require dedicated, expensive servers. Most leaders would probably agree that in-house technicians spend a disproportionate amount of time 'managing' these applications. Centralising these services significantly removes the complexity from within schools and colleges, and empowers technicians to redirect their focus from intricate technical details to maximising the benefits of using ICT for the purposes of teaching and learning. This can be achieved by working alongside the teaching staff to help embed ICT into the curriculum. When this happens, technicians will support teaching and learning, not devices. Therefore the device-related tasks must be the prerogative of the managed service provider whilst the teaching and learning support activities must remain under the management of the education professionals. The ICT provision must be developed to support and respond to this emerging approach to teaching and learning. For example, an extension to the teaching week and community access to facilities seven days a week means that technology has to be sophisticated enough to manage comprehensive needs. Consider the library resource centre in an 'all-through', full-service school. Various users - students of all ages, staff, parents, governors, and community members - must be catered for at various times throughout the day. The 'view' of the user system will need to be different depending on who it is. Permissions controlling access and software availability will reflect, at least, age, generic user type and, in the most sophisticated examples, individual differences in profile. The appropriate look and feel and content must be generated automatically at log on by policies and profiles. In terms of providing the best possible user experience, this must be achieved without complexity, securely and, most importantly, quickly - quite a challenging technical task given the wide range of potential users. The 'behind the scenes' internet and email filtering and the web-caching that protect and speed things up for the users must prevent students from accessing inappropriate sites. To be truly effective, systems must be able to release sites, which instinctively would be banned, to specific 'trusted' users whilst ensuring inaccessibility to others. For instance, some users such as sixth form students may require access to sites such as those promoting racial or religious hatred, extremist political messages or holocaust denial in the course of their studies. The sophistication of the caching and filtering technologies needed to perform such tasks flawlessly is immense, as are the underpinning operational policies and procedures. For vulnerable young people to be protected these systems must operate perfectly at all times. The card or biometric data which dictates access control will also be the same that registers students and records attendance and punctuality, allows the purchase of food from the cafeteria and enables extracurricular activities to be booked. All of these systems will be controlled through the same identity management applications and must be capable of instant update. So, as the complexity of school and college organisation increases and the demands on the systems change and develop, the technology needed to support them will become increasingly sophisticated. The human element of schools and colleges will also alter. Current teacher-centric models where everything is managed for the students will become a thing of the past as a learner-centric model takes precedence where learners are encouraged to take further responsibility. This approach facilitates distance learning and continual learning, which will gradually form a part of people's everyday lives. Today's students already have IT-rich lives and are eager to become immersed in our high-tech world by taking advantage of leading-edge applications. Technology will change their experience of education. Partnering with a responsive managed service provider is essential. Therefore, managed service partners who have the educational vision, the appetite for innovation and the skill to make the best of emerging technologies will be in high demand. Technologies in use in the education sector will continue to become increasingly integrated and revolutionary. If the BSF agenda delivers, world-class, 21st century learning centres will be created which will inspire learners for decades to come and provide facilities that entire communities can benefit from. The future will be lifelong learning: anywhere, at anytime, for anybody, covering any topic.